Commencing January 1, 2004, all businesses engaged in commercial activities must comply with the Personal Information Protection and Electronic Documents Act and the Canadian Standards Association Model Code for the Protection of Personal Information, which it incorporates. These obligations extend to lawyers and law firms, including Frederikse Law. The Act gives you rights concerning the privacy of your personal information. Why does Frederikse Law need personal information? 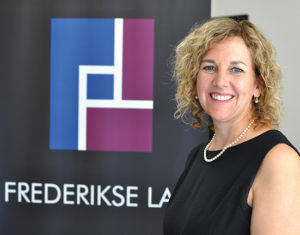 Frederikse Law provides legal services and products to a wide range of clients. We use your personal information to provide legal advice and services to you, to administer our client databases and to respond to your requests. Personal information is any information that identifies you, or by which your identity could be deduced. This information may include your name, address, social insurance number or employer. your accountant or financial advisors. In most cases, we shall ask you to specifically consent if we collect, use, or disclose your personal information. Normally, we ask for your consent in writing, but in some circumstances, we may accept your oral consent. In other situations your consent may be implied through your conduct with us. If you wish to withdraw consent to your personal information being collected, used and disclosed, please contact us at the address listed below. Please note that in some circumstances the withdrawal of your consent may limit the services we are able to provide to you. Frederikse Law does not disclose your personal information to any third party to enable them to market their products and services. For example, we do not provide our client mailing lists to anyone. Since we use your personal information to provide legal services to you, it is important that the information be accurate and up-to-date. If, during the course of the retainer, any of your information changes, please inform us so that we can make any necessary changes. We will promptly correct the information and address any inquiries you may have in connection with your personal information. Whenever it is legal and practicable, we may offer the opportunity to deal with general inquiries without providing your name (for example, by accessing general information on our website). Under certain circumstances, the Proceeds of Crime (Money Laundering) and Terrorist Financing Act requires us to confirm the identity of all new clients. It may also require us disclose information to FINTRAC in relation to certain large cash transactions. To help us make credit decisions about clients, prevent fraud, check the identity of new clients and prevent money-laundering, we may, on occasion, request information about you from the files of consumer reporting agencies. E-mail is not a 100% secure medium. You should be aware of this if you request us to send personal or confidential information by e-mail. If you apply to Frederikse Law for a job, we need to consider your personal information, as part of our review process. We normally retain information from candidates after a decision has been made, unless you ask us not to retain the information. If we offer you a job, which you accept, the information will be retained in accordance with our privacy procedures for employee records.